I admit that we didn’t take hand washing very seriously before kids come along. Not that I don’t wash my hands, I just do it superficially. Don’t many of us do that? Well, 针不扎到肉，不知道痛. When Thaddeus was barely a month old, he was admitted into hospital because blood traces were found in his poop. The A&E doctor told me that my little one probably had Rotavirus because we didn’t wash our hands clean when we handled his bottles and teats. Needless to say, I was buried in mommy’s guilt. Although the Paediatric Gastroenterologist confirmed that it was not Rotavirus that my son had in the end, I decided that I should not risk my kids’ health with my slip-shoddiness in hand washing. Working in hospitals makes me even more conscious about keeping my hands clean and I make sure to wash my hands (and even my feet!) when I get home and before touching my kids. Hence, I cannot emphasize enough on the importance of hand hygiene (especially for kids ‘cos they touch every dirty thing you tell them not to!). It’s a simple habit and it goes a long way to help prevent many diseases. Lifebuoy celebrates Global Handwashing Day on 15 Oct 2012 across 100 countries around the world to support a global culture of hand washing with soap and to raise awareness about the benefits of hand washing for children. Did you know that 3000 children under 5 years old die due to diseases like diarrhea and pneumonia every day? Many of these deaths can be prevented through the simple habit of regular handwashing with soap. For the 5th year running, Unilever, through its Lifebuoy brand, will work with the Millennium Villages Initiative to bring hygiene education to children across 10 countries in Africa. Through this campaign, they hope to help save young children from potentially fatal diseases caused by poor hand hygiene. How can we help? By pledging on Lifebuoy’s Facebook page. No kidding. It is really that simple! 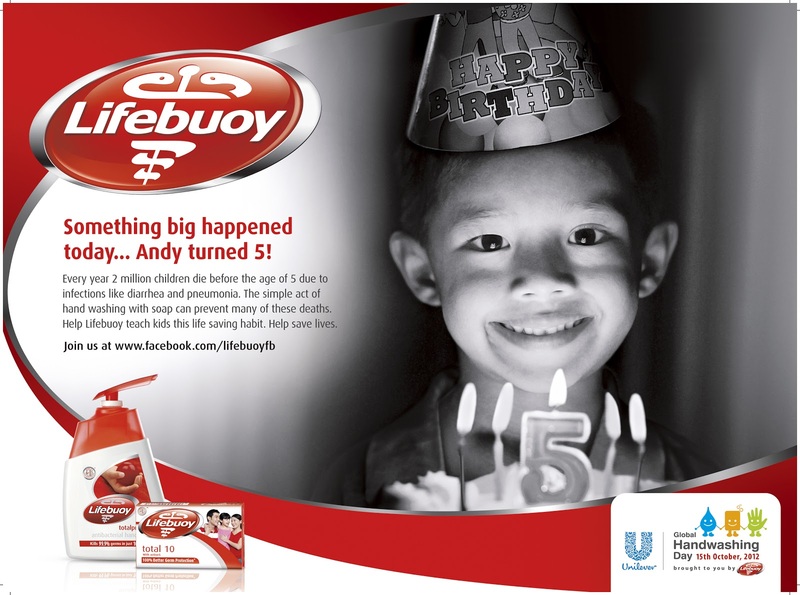 With every pledge, Lifebuoy will commit to teach a child hygiene education through PSI, a Unilever Foundation Partner. Pledge to help a child reach 5 this Global Handwashing Day!